The people of Australia might not celebrate Thanksgiving, but every November, plenty of animals in the northeastern part of the continent have something to be thankful for, and they gather together for a feast. The yearly bounty comes courtesy of the metallic starling (Aplonis metallica). These glossy looking, red-eyed birds migrate from New Guinea to northeastern Australia in mid-November, where they stay through the summer monsoons to lay their eggs and raise their chicks. When they arrive at the Cape York peninsula in Queensland, they form enormous colonies, with 1000 or more birds building dome-shaped nests in the same tree. The activity draws plenty of attention from local wildlife. Insects, amphibians, reptiles, mammals, and other birds all crowd around the colonized trees to feed on plants that are fertilized by the starlings’ poop, and to eat starling eggs, nestlings that fall from the nests, and even other animals that are attracted to the colonies. 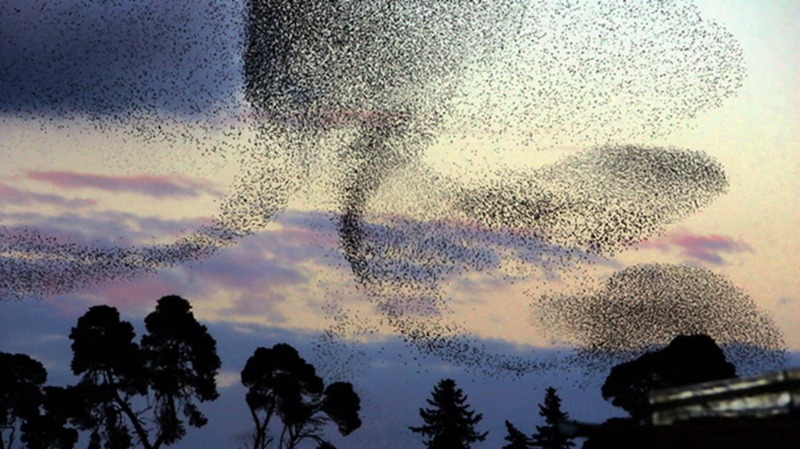 You can see an example of starlings congregating in a tree (likely in Cornwall, UK) in the slo-mo video below. While the entire video is worth a watch, jump to 2:05 for their spectacular departure. In Australia, the lure of the buffet is so great—and consistent, because starlings nest in the same trees each season, and some trees will host colonies for 15 or more years in a row—that the birds’ arrival radically alters the distribution of wildlife in Cape York’s rainforests, says ecologist Daniel Natusch. The trees they colonize become “ecological hotspots,” where different species gather in great numbers. Natusch and other researchers at the University of Sydney recently described these hotspots for the first time in a paper in PLOS One [PDF], cataloging the species that show up—42 taxa, not including insects—and measuring just how “hot” they are. The small (just 32 x 45 feet) areas under the trees, the scientists say, host some of the largest and most diverse animal congregations in the world. Natusch’s team took regular wildlife censuses for about 18 months beneath 26 starling colonies. They hung flypaper from the trees’ branches to catch flying insects; collected and sifted through soil to find other invertebrates; and used trail cameras to collect candid shots of mammals, reptiles, amphibians, and birds. They then compared these animal assemblies to the ones they found at nearby trees that didn’t house starlings. The researchers documented 42 different species—from cattle and kookaburras to rats and pythons—beneath the starling colonies. Brush turkeys and pigs—both seen in the images below—showed up more often than any other species, and the largest gathering they recorded included 50 different individual animals. Overall, they found significantly more animals at trees with starlings than those without, and the densities of some species were 100 to 1000 times higher under the colonies than elsewhere in the rainforest. The communal nesting colonies of the metallic starlings attract many species, including (clockwise from upper right) scrub pythons, brush turkeys and palm cockatoos, and pigs. Lots and lots of pigs. Image Credit: © 2016 Natusch et al. “To our knowledge, this system represents one of the highest-biomass and most diverse faunal aggregations in the world,” the scientists write. It’s not hard to see why the starlings draw such a crowd. Guano from thousands of birds enriches the ground beneath the colonies with nutrients, attracting soil-dwelling invertebrates and fertilizing plants. The bugs and plants attract herbivores and insectivores, which in turn draw predators higher up on the food chain. When the monsoons come and strong winds knock nests to the ground, carnivores like dingoes and snakes also feed on fallen starling eggs and chicks. These hotspots are impressive, but Natusch thinks scientists could also put them to practical use. Since the colonies attract some of Australia’s most destructive invasive species, like feral pigs and cane toads, the researchers suggest that they could be sites for targeted control. When large numbers of problematic animals gather at the same tree, conservationists could capture or kill them in one swoop—giving Australia’s native wildlife one more reason to be thankful for the starlings.